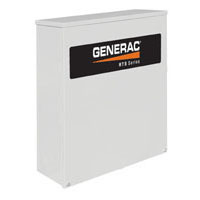 The Generac automatic transfer swich model #RTS-C-200A3 is used for the distribution of electrical loads up to 200amps, single phase, 120/240v. This switch can be installed inside or out. This is not a service entrance rated switch but can be used for the distribution of utility/generator power in many different applications. Feel free to consult with Home Power Systems for the switch that best fits your needs.